This entry was posted in Kayta's Photo Blog and tagged Kofu, Yamanashi. Bookmark the permalink. Thank you, Ben. 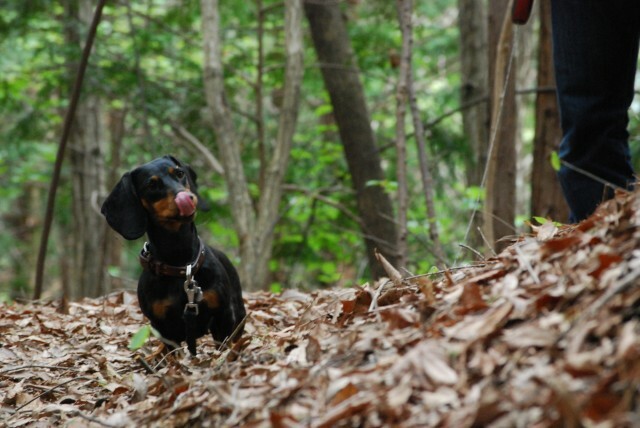 Always curious and always ready to dart away chasing (in a hope to kill) cats (cows are ok too ); our Maya-san is a real dachshund. As a cat-owner, I read with some distress of Maya-san’s predilection for cats (not to mention cows). I hope that she’s a poor hunter of cats – though of course, that doesn’t stop her from wanting to catch with all her body, heart and soul. Our cat is very strange… he’s incredibly gentle… and it doesn’t matter if wild birds are within a jump’s distance away, he’ll just watch peacefully. Well mostly. You can tell that some part of him is still 100% cat. But it seems that a kind soul, or perhaps just laziness, gets the better of his instincts. mmmm….. Unfortunately, Maya-san is an experienced pro and therefore she is kept on a short leash, and therefore I’m checking every bush my dog is about to inspect. I heard that cats got lazy and indifferent after some surgical operation? Hehehe…you could be right about that. But, in his case, it’s most probably the gentleness/laziness helped out by the fact that he’s carrying a little less weight downstairs…. combined with the fact that he’s carrying too much weight everywhere else.